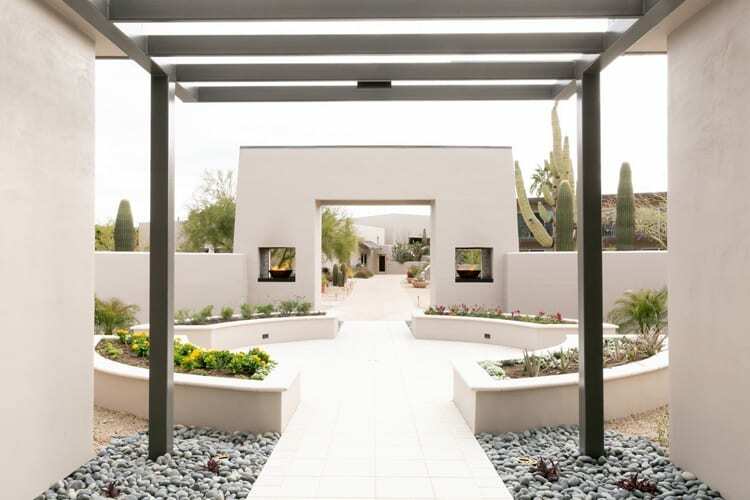 Nestled in the high Sonoran Desert, just outside of Scottsdale, AZ, CIVANA has completed its nearly $50 million renovation and repositioning with the grand opening of its new Spa. Centered around a rich heritage of sustainability and a holistic menu of distinct, fully customized treatments, the two-story, 22,000 square-foot spa is an integral part of the CIVANA experience, which offers travelers a progressive journey toward wellness that is grounded in principles of flexibility, attainability, and innovation. One of the largest destination wellness retreats in the country, the state-of-the-art spa facility features 28 treatment areas including one Watsu® therapy pool, two couples treatment rooms, three wet treatment rooms including a Vichy shower, five facial rooms, and 13 massage rooms. There is also a communal area of hydrotherapy immersions – the Aqua Vitality Circuit – that includes a European-designed Kneipp hot/cold wading pool, a Tepidarium therapeutic soaking pool, a cold deluge shower, and a five-climate KLAFS SANARIUM®– the only one in the continental U.S. All hydrotherapy modalities are designed to help increase circulation and promote relaxation without adding strain and boost immunity. Treatments include signature Wellbeing Therapies that blend a variety of modalities for a more holistic experience; dedicated facial skincare and massage therapies; Energy and Eastern Therapies such as Reiki, Thai massage, and Craniosacral; Body and Water Therapies to promote head-to-toe wellness such as Sonoran Rain Dance; and Spa Journeys for Two for those seeking to experience the Spa with a loved one. CIVANA has two dedicated couples treatment rooms that offer private, exclusive treatments and relaxation. In addition to dedicated men’s and women’s relaxation areas, guests can also enjoy a 1,600 square-foot co-ed relaxation lounge with an outdoor balcony offering majestic vistas of Black Mountain Mountain and unforgettable Sonoran Desert sunsets. For sun seekers and swimmers, the Spa boasts an Olympic outdoor lap pool and sun deck with healthy food and beverage options, including a healthy organic cocktail menu. There is also a boutique retail shop and salon offering all-natural nail and hair services and unique curated products. The CIVANA brand was born in 2017 out of a desire to make authentic and holistic wellness more approachable for the everyday traveler. Less intimidating (by design) than other destination wellness resorts, CIVANA offers each guest the flexibility to create an impactful, immersive experience that best suits them – from devout students of wellness who want to dive deeper to those who simply want to relax and unplug. Along with the two healthy dining venues – Terras and Café Meto – the spa completes the four pathways of CIVANA’s wellness model – Healthy Cuisine, Movement, Discovery, and the Healing Arts. For more information on CIVANA or to view the full Spa menu, visit www.civana.com or call (480) 653-9000.